Thanksgiving. A time to spend with those you love. Or at least it's "supposed" to be that way. Expected, actually. Last year, about this time. I didn’t feel much like it this year, for obvious reasons. 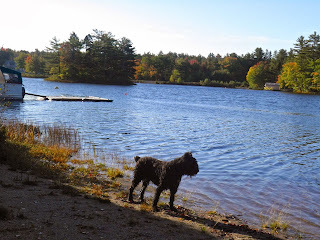 It has only been six days since I said goodbye to one of the best friends I will ever have in my life – our Bouvier, Henry. So I wasn’t really in much of a mood to celebrate. But I was in a mood to reflect, and be thankful. There’s been way too many storm clouds of late. We’ve replaced almost everything major in the house – front door, roof, furnace, bathroom, water system, well – and then to top it off I lost my best buddy to cancer. He was supposed to be my companion here in the country while I started this “brave, new life.” That certainly didn't pan out. I think I’m due for some good, or at the very least different, luck. I suppose, if you look, there’s always something to be grateful for: my spouse is doing exceptionally well at college, and my family understood that I wasn’t up for a gathering (usually a guilt-laden affair if you have the temerity to miss one). And even though I am feeling pain, that pain wouldn’t be there unless I had Henry, and all he gave me, in my life – however too short it was. So I am thankful, for so very much. So what did we do instead of the hurly burly of a family get together? I decided to forgo the turkey and have veal instead. I can hear you all now. “Veal?” Boo-hoo. Things die. Don’t get me started. But really, why veal? A couple reasons. 2. It was already dead. I usually don’t subscribe to eating veal on principle, but this was already laying there in its little black tray. So why not. You can substitute beef or pork if you wish. No harm, no foul. We rounded out the meal with (almost) all ingredients we grew ourselves in our small garden this year. It’s sort of bittersweet to go out to that garden. Henry used to follow me out there to beg for fresh beans. He loved beans, and peas, and carrots. And yellow pear tomatoes. I don’t think I’ll ever be able to see one again without thinking of him standing next to me as I picked from the vine, to his utter enjoyment. But this cool Thanksgiving night it was just my spouse and me, a spade, some carrots, beets, onions and fresh herbs. 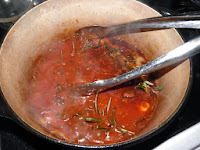 Even the tomato sauce used to braise the meat was from our own Roma tomatoes. So as we sat together at the kitchen table for our truncated family feast, I was able to reflect, and enjoy the company I am so grateful to still have, and remember the shared, undying love of someone who left my life so very recently, and far too soon. 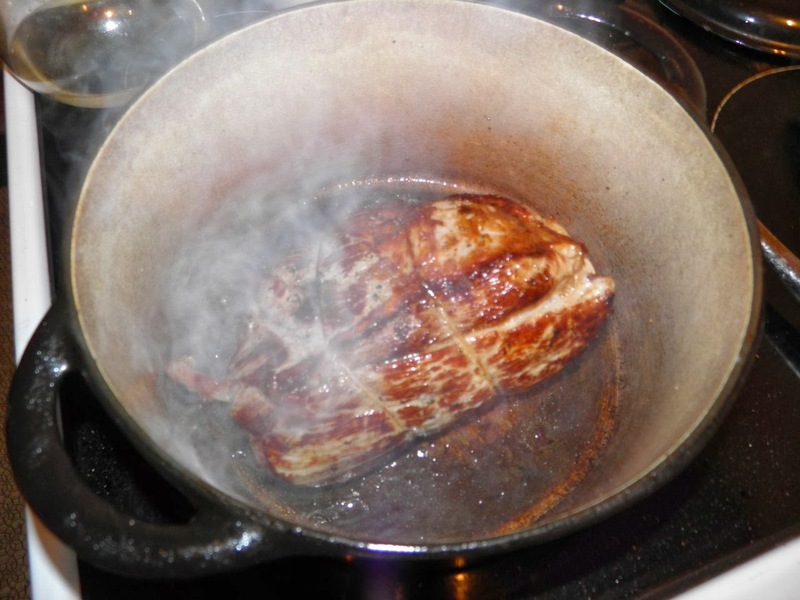 Heat the olive oil in a Dutch oven or other heavy pot with a cover. Season the roast with salt and pepper and sear until brown on all sides. Once browned, remove to a plate. Add the onions and sauté for about 4 minutes until the begin to brown and soften. Then add the garlic and sauté for a further 2 minutes. Lay the rosemary sprigs on top of the onions and garlic. You need enough to cover the bottom of the pot. It’s a lot. You can use less if you wish. Add the cranberries, tomato sauce, red wine and some more salt and pepper. Nestle the roast into the pot, cover and bring to a boil. Then reduce the heat and simmer for 2 hours. At the end of that time check the internal temperature. It should be about 140°F. 1. If you’re eating it right away, continue to cook until done to your desired internal temperature. 2. If you’re making it ahead, remove from the heat at 140°F, let cool and refrigerate. 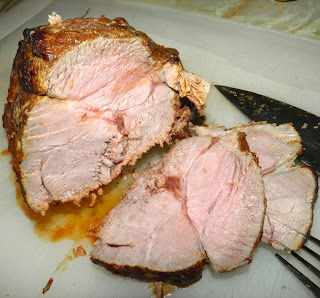 To finish, heat the oven to 375°F and roast, covered for 1 more hour. 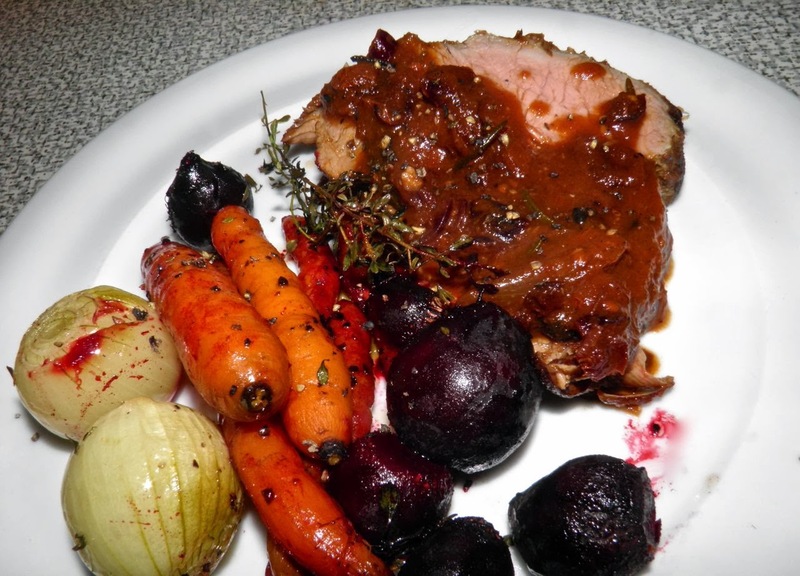 Serve slices of roast with the cranberry/rosemary pan sauce. The 375°F also allows you to roast a pan of vegetables at the same time to serve for your meal. I find family celebrations a bit hard to take, because of all the self-inflicted stress, short tempers and hubbub. Making the roast ahead and finishing it “on the day” is a wonderful way to take the stress out of holiday gatherings.